Märklin has survived several generations of ownership, three factory relocations, eight gauges of toy trains, and two world wars, but the most crucial and undoubtedly pivotal time was during World War II. With its introduction of 00 Scale in 1935, Märklin faced huge potential; the smaller scale required fewer raw materials and the dream of creating an expansive model railroad complete with stations, bridges and track accessories was realized for many hobbyists. The range of 00 Scale production expanded at a quickening pace: the SLR 700 in 1936, the HR 700 and HS 700 locomotives in 1937, the CCS 700 prototype in 1938, and the “Perfekt” reverse system of the 800 series in 1938. These models were also offered to export markets and sometimes detailed with special paint schemes or additions. In 1937 and 1938, export models were sent to Great Britain and were painted in the LMS and LNER livery. Despite its rapid progress, Märklin foresaw the early warning signs of a war. The last full-release customer catalog was produced in 1940 and contained no new models. The dream of a 00 scale crocodile was never realized and the CCS 700 prototype was put off until the postwar years. But Märklin’s pre-war wariness did not show weakness or hesitation, it showed genius. By not expanding its product range, Märklin vouchsafed a steady flow of revenue during WWII by producing models that had not changed much since 1938. This required far less materials and technical complexity of the later “Super-Modelle” series from the immediate postwar production. Märklin employees assemble and test SK 800 locomotives in late 1945. 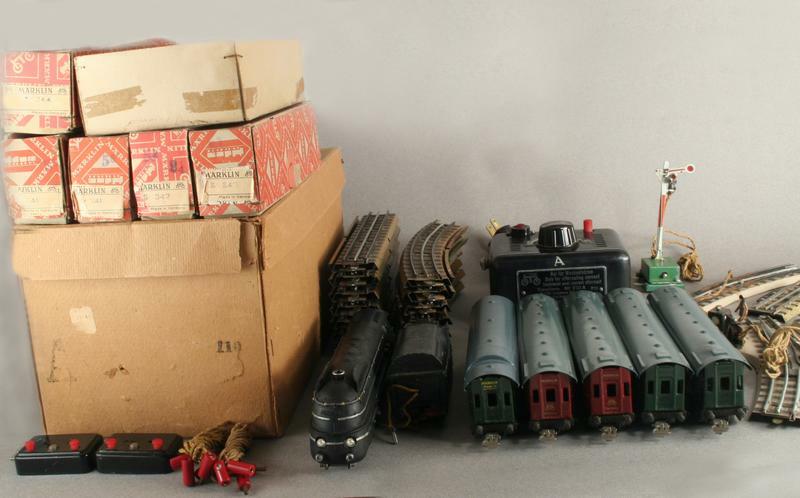 During the course of the war, Märklin maintained a difficult balance of the production of war materials and toys all the way up to early 1943 when the production of toys ceased. Märklin had the task of producing the Entlastungzunder 44 (E.Z. 44), a device commonly used to prevent the removal of mines which would detonate when lifted. These pressure-lifting devices required special fuses, springs, and clockwork mechanisms. Märklin’s penchant for producing precision technical toys suited them perfectly for this task. 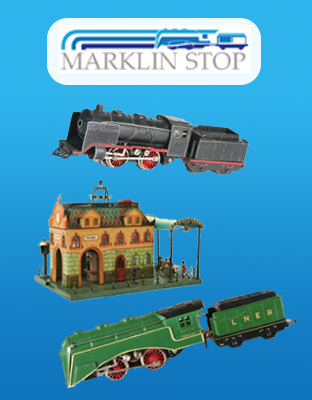 Although Märklin is known as the primary producer of the E.Z. 44, some examples have been found with a marking which is believed to be that of Shuco, a German toy manufacturer. Design drawing of the Entlastungzunder 44 (E.Z. 44) pressure-lifting device. During World War II, the Werhmacht assigned production codes to factories that aided the war effort. Märklin carried the production code “BKG” on the Werhmacht production list. Similarly, Fleischmann and Wiking had their own Werhmacht production codes, “BZF” and “BXY” respectively. These production codes would be stamped on crates or engraved into metal goods. Märklin also produced other technical instruments and machined parts for the war effort including detonators, belt buckles, torpedo motors, and aircraft instruments. One account from a U.S. Army intelligence officer who visited the factory towards the end of the war states that these war materials were produced in a special section of the Märklin factory located on the lower floors concealed behind a single, unmarked door. When the American officer visited the Märklin factory to gather intelligence, he was given a complete set of Märklin trains including the 351 F “Fuhrer” wagon, a seemingly controversial gift of the time. U.S. 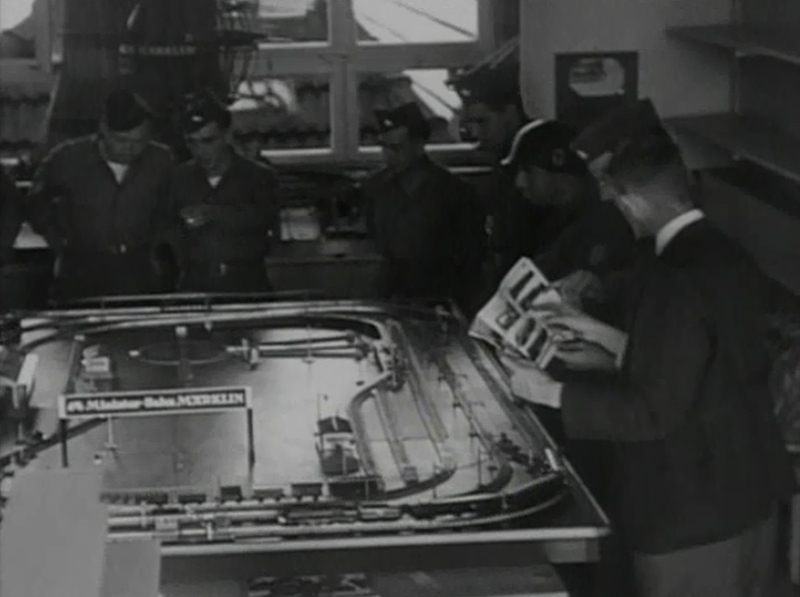 Soldiers observe layout in the Märklin factory showroom and browse a pre-war catalog with a Märklin salesman. In addition to its forced production of war materials to support the war effort, Märklin also protected itself from the unstable and violent political climate of the time. Although no records point to a formal affiliation between Märklin and the Nazi party, Märklin did produce articles which portrayed the symbol of the German socialist party. These items include the 351 F with two Nazi eagles affixed to the coach’s sides, the 5521/10 Mercedes Fuhrer car, the 00 Scale 406 Nazi flag, and the large-gauge 2611 H Nazi flag. Only one of these items is pictured in Märklin’s customer catalogs and only some of the others can be found in supplemental catalogs. Compared to other toy companies in Germany during WWII, Märklin’s production of toys which included the Nazi symbol was extremely minimal and on a very small-scale. When war production stopped, Märklin still had over 700 employees and restarted production of toy trains to be sold in 1945. Although the city of Goppingen was relatively protected because it was a Red Cross camp, it still faced involvement in the war simply because of its many factories and railway centers. On April 12, 1945 the 9th Air Force escorted by the 95th Air Force bombed a marshalling yard at Goppingen, crippling railroads in the area. Weeks later, over 1,200 8th Air Force “Forts and Libs” (Fortresses and Liberators) flew to Southern Germany to destroy rail centers in the towns of Hellbronn, Bruschsal and Goppingen. Although some sources say that Goppingen was untouched by these bombings, it is difficult to determine the outcomes of these bombing raids. Due to the stress of the war, production dropped from a pre-war average of 65,000 trains to an average of 25,000 trains per year during World War II. The main source of revenue for Märklin during the wartime was the domestic sale of pre-war trains that continued production into the early years of the war. Towards the end of Nazi occupation in Europe, trains were also sold through special PX-shops located throughout Europe which offered Märklin miniature railway sets for sale to American GIs and local civilians. Several PX sets were offered in late 1945 including the SK 841/4, SK 851/4, HR 841/4, HR 851/4, and RS 827 which were all sold in either red set boxes similar to the pre-war versions or a special “PX Box,” a plain brown box with “110 Volts” stamped on the front for American export. These train sets were sometimes shipped to the United States in wooden crates via the military postal service. The SK 800 locomotives sold during this time were a special “bruniert” type, unique because of their burnished black finish. These sets also have a distinctive “PX track” because in Nurnberg, the factory that printed roadbed designs on the 00 Scale Märklin tracks was destroyed during a bombing. For this reason, tracks that were sold during wartime and the immediate postwar period are either leftover pre-war tracks or tracks without a printed roadbed. The instruction sheets included in these sets, “Instructions for the Electric Miniature Railway Gauge 00,” are commonly found with print code “A 0845 r,” denoting a print date of August, 1945. An SK 841 PX-set marked 11/1945 which was sold to an American soldier stationed in Germany. Märklin’s production of toys was so important to Germany that in late 1945 the “Welt Im Film” (World in Film) news crew filmed the Märklin factory and showed its incredible postwar success. The segment was called “Göppingen: Eine Friedliche Industrie” (Goppingen: A Peaceful Industry) and portrayed the remarkable strength of the Märklin factory. The newsreel shows several key aspects of the factory including the main production floor, the factory showroom with several American soldiers running locomotives on a layout, and the humble beginnings of the Märklin museum displays. Märklin had survived the war and found itself in the perfect position for the 1947 introduction of the “Super-Modelle” series which had been a dream since the early pre-war CCS 700 prototype of 1938. American soldiers stationed in Germany for the rebuilding of the country were delighted to see locomotives of the “Super-Modelle” series based on American designs like the electric DL 800 locomotive. Märklin’s inclusion of such American models could possibly be seen as recognition of the important role which American soldiers played in Märklin’s survival during WWII. A multi faceted contribution to history. Nice reading. Thanks for providing this Paul, very interesting reading indeed – the topic of Märklin’s involvement during the war has come up many times on forums without much success – I guess the native German-speaking forums have covered it but not so easy to find for non-German speakers. Indeed some of the responses go as far as to say/imply ‘leave it alone’ (aka don’t rock the boat, leave skeletons buried, let sleeping dogs lie, fools rush in… etc etc). All that does is to frustrate those (like myself) who have a genuine interest in Märklin in all aspects of her operations, wartime being no exception. I think as adults we all have sensitivity and maturity toward the details surrounding those dreadful times but to see a printed example of a munitions item produced by M. is truly remarkable. Do actual examples survive?, do they trade on the open market (I know Ebay has some pretty strict polices in Germany about such items). Also, can I ask what was the source of this information? – ex-employee, a returned soldiers’ account etc etc? There are some actual examples of munitions produced by Marklin that are still around today. They are of course very hard to find because they would have to have Marklin’s production stamp. Research for this article was primarily done by looking through newspapers written during WWII like “Stars & Stripes”, interviewing U.S. soldiers & their families, as well as some documents I have in my collection about Marklin during WWII. Very well researched and written. Congratulations! I was unaware of the types of munitions Marklin produced. Thanks for your info. And just to keep the record strait the HR700 and HS700 were first available in 1937. The SLR 700 appeared in 1936 as did three color versions of the TWE 700. Excellent info! I have been a Maerklin operator/collector since I was 11 back in ’64 and I never knew anything about Maerklin during the war. I remember reading that after WWI many employees unfortunately did not return to work but not much was ever said about WWII. Thanks. what does the term “PX-Laden” stand for? Laden (with Um;aut on the a) means: members. But what does the PX stand for? I believe the term is a mix of German and English, Bert. “PX” was common during WWII and they still exist today. Soldiers could go to PX stores (Postal Exchange) to buy common goods — it was kind of like a hardware store for members of the military. This is where many of the Marklin sets were sold both in the US and abroad. “Laden” in this case means “shop”…I can’t verify the German, but that is how I have seen the term “PX-Laden” used. PX is short for Post Exchange. The Post Exchange, http://en.wikipedia.org/wiki/Base_Exchange , was in Germany on the U.S. military bases taken over by the Allies from the Germans. They were like department stores on the larger bases and like variety (dimestores) on the smaller bases. They offered almost everything a serviceman could wish either on site or through a catalog ordering system. All prices were in US$ and in Germany wares were first offered from the U.S. and the local economy, such as Marklin trains, Schuco toys and cuckoo clocks kept stocked on site, and a few years later also new automobiles, including US models and foreign makes, could be ordered for local delivery or delivered to an U.S. address. Marklin must have been delivering directly to the U.S.Post Exchanges in Germany where the PX workers, often German nationals, would receive, mark with price stickers and display. Post Exchanges were only available to a person with a valid Allied Military I.D. The descriptions of the bombing raids is utterly incorrect. If on April 12, 1945 B24 Liberators were attempting to destroy the railroad marshalling yards, they were of target, because, the bombs dropped were hitting the approaches of a bridge, that spanned the railroad yard. Then six weeks before that raid, not weeks after, namely on March 1, 1945 35 B17, dropped bombs on Goeppingen. (Originally it were supposed to be 72, but due technical problems 37 bombed their secondary targets) Again the railroad center was missed, and the bombs hit the upper city, away from the railroad yards. Maerklin was not hit, the bomb closed to Maerklin exploded, according to my estimate about 500 meters away from tje plant. This writing is not due to research, but the way I saw it, because I am an eye witness and lives thru it. Thank you for your incredible insights. It is from people like you who have been through the events that we learn the most important information. I, however, am very limited by the information that I see through research. I’ll have to dig up the research where I found the info about the bombing raids. If I’m not mistaken that info was found in a Stars & Stripes newspaper or a similar historical publication. I am currently researching for a documentary film regarding the “End of the War” in Göppingen. We have received one or two photos from the US National Archives depicting Märklin workers at the factory shortly after the end of the War (June 1945 or thereabouts). I would be interested in the results of your research regarding Märklin in the immediate post-war period (April-July 1945). Thanks for your article about Marklin during the war; my Dad could be one of those in the photograph at the factory showroom. In 1945 he bought two complete sets, one freight and one passenger, both with RS800 locomotives, and lots of track. We still have both sets in the original boxes with the original sales receipt from Goppingen. They are a treasured family heirloom. There are very good German language books, filled with depictions, on the subject of the bombing raids on Goeppingen. Also, amongst other things the Maerklin Company produced for the Wehrmacht, there were MG34 and 42 machine-gun non-disintegrating bullet belts (stamped steel) and the trigger guards of Mauser G41 semi-automatic rifles. Like other companies in the Goeppingen area that were involved in the manufacture of weapons and parts thereof, not much has surfaced locally in reference to items and production figures. Supposedly the Americans confiscated most of these companies’ archives during their initial intelligence gathering. 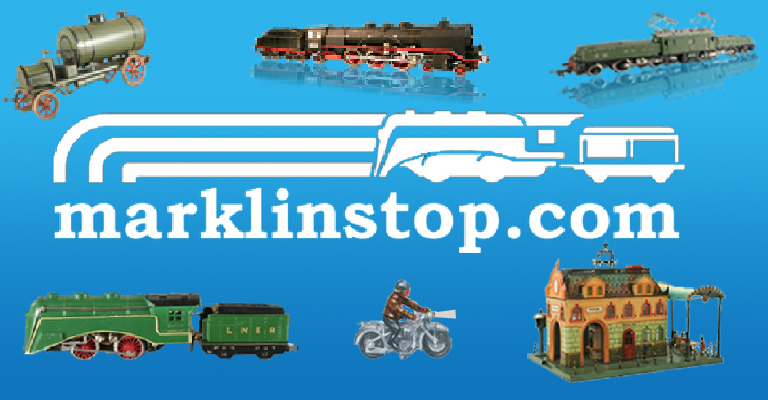 BTW, this weekend Maerklin is celebrating their tenth Maerklin-days-event in and around Goeppingen. I just ran across this and happen to have one of those sets. The engine has exploded due to zinc pest but the cars are in excellent shape. I also have the boxes for the cars and the box with the post exchange marking on it.